This is a remarkable disc. Without a doubt one of my discs of the year - following hard on the heels of another - a superb performance of Zemlinsky from the Escher Quartet. Indeed I would go further and say, I would hope this gets the recognition it deserves and is considered for major awards. It really is that good. The Dimension Trio was founded in 2000 but according to their website this is their first disc. Recently I greatly enjoyed a collections of trios played by the excellent Smetana Piano Trio. The fascination there was the manner in which three strong but disparate musical personalities came together to create a collective whole. In contrast the Dimension Trio play as one - the level of unanimity both technical and musical is amongst the very finest I have ever heard. Yet this is not to imply there is any degree of faceless conformity, far from it - this has to be some of the most thrillingly passionate and powerful chamber music playing I have ever heard, It's all executed with a phenomenal degree of accuracy. The disc opens with quite the finest version of Frank Bridge's surgingly Romantic Phantasie Trio of 1908 I know. This would seem to be a bit of a signature piece for Dimension. It features in reviews from a 2006 Wigmore Hall concert and indeed can be heard streamed from their website in a different performance than this one from 2007. I urge you to listen to that streamed performance as the style of it epitomises the qualities on display here. Worth noting too that the streamed performance has the same engineer/producer as here - Andrew Mellor - and in those terms too this is an excellent disc. They are very similar interpretations and the general style holds gloriously true for the entire disc - so listen to the stream and then buy this disc. What a wonderful, passionately direct work this Bridge is. For sure nowhere near as harrowingly powerful or profound as his later chamber music masterpieces but as dynamic a quarter hour of music as written by any British composer before World War I. Another disc I enjoyed recently was of early Vaughan Williams chamber music - but alongside this work they pale to the apprentice works they were. Bridge's piece was his winning entry for the 1908 Cobbett Chamber Music competition. This was aimed at building a body of contemporary British music founded on the - notionally - English musical form of the Elizabethan Phantasy. In reality this meant a single movement work that played continuously but consisting of differing but linked passages. The underlying intent was to free British music of the suffocating influence of continental and primarily German composers. I listened to the excellent Hyperion/Helios disc of Bridge Chamber music from the Dartington Piano Trio for comparison. That remains valuable for programming this early trio with the more Bridge - the Piano Trio No.2 and Phantasy Piano Quartet. In fact, I had forgotten what a good performance that is. 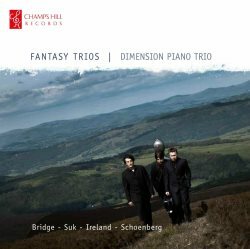 Somehow the Dimension Trio find even greater reserves of expressive intensity to lift their interpretation to an even higher plain. From the eruption of energy in the opening bars through to the work's powerful conclusion the listener is swept along by the music's sheer vigour and invention. Anthony Payne in his brief but cogent study of Bridge's music admires the skill with which Bridge handles and develops the material while feeling it shows a certain naivety too. I bow to Payne's expertise but I love it and in a performance as committed and dynamic as this any such reservations seem irrelevant. Indeed, the more I listened to this disc the more I felt I was putting down my metaphorical critic's pen and just listening in pure unalloyed pleasure - these are music and performances that transcend 'criticism'. The second and shortest work on the disc is the wonderful Elegie by Josef Suk. If Suk's orchestral works - Asrael especially - are just beginning to make an impact on the collective music-loving-public's consciousness then his chamber music remains stubbornly unknown. Yet there is a very fine three disc set on Supraphon (11 1531-2 111) - led by his grandson the marvellous violinist Josef Suk - which contains it all and I would urge the curious to seek it out (review review). That set contains both versions of this Op.23 Elegie; the original for violin, cello, harp, string quartet, harp and harmonium and the composer's own arrangement of the work for Piano trio as presented here. As with Asrael, this is a work of mourning and memorial. Here for the important Czech poet and playwright Julius Zeyer who died in 1901. This is a gem of a work and receives by far the best performance of it I have ever heard. I can give it no higher praise than to say it is finer than Josef Suk's own version(s) mentioned above. The playing here is full of such tender regret and poised longing. I do enjoy the original instrumentation too - the harp adds a bardic halo to the often simple accompaniment and the harmonium - all but inaudible in the Supraphon recording - adds a sustained richness and weight to the string quartet's role. The transcription to piano trio brings benefits too and they are clearly to the fore here. Violinist Rafal Zambrzycki-Payne and cellist Thomas Carroll both float melodic lines with extraordinary control and refinement - listen to the closing minute and a half for music as poignantly beautiful as any I know. The Dimension Trio evoke a tender rapture that is as exquisite as it is rare. It is worth digressing for a moment to mention the quality of the engineering and production of Andrew Mellor. The piano trio format is a notoriously tricky one to capture effectively. The three instruments contribute so differently to the musical whole that to create a believable sound stage tries the skills of any engineer. I have to say Mellor has achieved what is to my ears a perfect balance; beautifully detailed but allowing all the instruments to register realistically on the soundstage. Again, I advise listening to their website stream - Mellor engineers that too. If anything, the sound there - allowing for the compressed nature of the audio - is even more immediate and dynamic. The CD sound is more sophisticated and allows the full expressive range of both music and playing to register. Anthony Hewitt's piano is a beautiful instrument and I must mention here his individual contribution too. Again it is the expressive range that impresses from the stormy opening of the Bridge to the gently thrumming accompaniment of the Suk and beyond. Following the Suk is another Cobbett-inspired Phantasie Trio, this time by John Ireland. In fact this piece won the second prize of £10 to Bridge's first of £50 in the same 1908 competition. This is the most familiar and most recorded of the works performed here and one that has also received several fine recordings. My comparisons were Lydia Mordkovitch and colleagues on Chandos - part of a comprehensive two disc survey of Ireland's Chamber Music, and The Holywell Ensemble on ASV - another Ireland survey but here on a single disc. In such company the Holywell performance is wanly competent and good though the Chandos disc is, even the excellence of the playing there is left behind by this performance which finds layers of detail and nuance the others miss. Ireland and Bridge are near exact contemporaries - Bridge the older by six months. The fascination is the differences between two superficially similar works. The Bridge sounds like a younger man's work; bigger in intent, bolder less subtle. Even in his 20s Ireland was perfecting the compact structures and smaller forms that characterise his finest and most typical work. His trio running to just eleven minutes, is more emotionally contained. Not that it lacks range or power, simply that Ireland's emotions are more considered, less elemental. Again I have nothing but admiration for the subtlety and skill of the Dimension Trio's phrasing and innate musicality. I find their use of rubato to be ideal, never distorting an underlying pulse or lingering sentimentally but rather simply pointing out the key note or two in extended phrases. After the passion of the Bridge and the angst of the Schoenberg to come this acts as a perfect foil - lyrical and clear-headed. This has more of the feel of an 'English' work and the players adapt their style accordingly. Simplicity is the key here but backed up but remarkable technical address. So far, its three out of three for great music marvellously performed. Which brings us to the real curio on the disc and my motivation for requesting it for review. I had no idea that anyone had tried to adapt Schoenberg's ravishing beautiful Verklärte Nacht for Piano Trio. Given that the composer himself tacitly acknowledged that the work was bursting the boundaries of its original String Sextet form by twice arranging it for Symphonic Strings, to reduce the instrumentation seems brave at best [I see from IMSLP there is an arrangement for solo piano as well]. The arranger here is Eduard Steuermann, a piano pupil of Busoni and composition pupil of Schoenberg. He made the arrangement in 1932 at the request of Alice Moller, a Viennese patron of the Arts, for performance in her home. It was finally published in 1993. If in some strange future world I was forced to choose between the string orchestra version and this reduction, reluctantly it would be the former but this is remarkably effective. Not surprisingly, the 'biggest' sections seem less effective but the trade-off is other passages of breath-taking intimacy and serene beauty. The score of the trio reduction is available but I have not seen it. Relying on my standard/original string sextet version the fluency and skill of Steuermann's work is clear. In the main, although far from exclusively, the violin part follows the first violin of the original. After that the other two instruments interchange their roles and not always in obvious or immediately predictable ways. For example - a rising pizzicato figure originally allotted to Viola I (4 and 5 bars after letter G in the Eulenberg miniature score), which although marked ff crescendo lies perfectly easily within the instrument's standard range. Transferred to the trio's cello but played at original pitch this suddenly becomes a virtuosic figure which punches through the texture with far greater prominence. Aided by the brilliance of Carroll's playing - he gives the repeated high notes a Bartókian intensity - the music's picture is quite changed. Earlier, Steuermann has to negotiate the problem of transferring sustained string chords onto the keyboard which by definition cannot sustain anything. His solution - the same as Suk's in the Elegie in fact - is to make the chords tremolando: rocked rapid repetitions within the chord. This is just about the only solution there is and it remains only partially satisfactory - the energy of the repetitions working contrary to the stillness of the original held chord. The insights of the arrangement in general and the breath-taking brilliance of this performance in particular outweigh any passing concerns. This is a very demanding expressionist score in any version. Players are asked to use a dynamic range from pppp to fff. My abiding impression is just how well the Dimension Trio encompass this range. It is not simply one of dynamic - it is the tonal and expressive quality that accompanies the dynamic. The lyrical passages are delivered with heart-stopping beauty and directness. Malcolm MacDonald's typically illuminative note explains Schoenberg's handling of the Dehmel poem excellently. The poem's five sections transcribed in essentially a two movement work moving from the angst of the D minor centred opening to the serenity of the D major centred transfiguration. The turning point is the arrival into D major 18 bars or so after letter M marked Sehr breit und langsam. This is the emotion-laden "man's reply" given in all versions to the Cello I part. Has a simple broken D major triad ever sounded so beautiful? The lead part is marked f over an mf accompaniment. Again Carroll pitches this to perfection - confident but not forced with those little expressive accentuations that lift the entire interpretation and are so typical of all three players. Turning for a moment to a full string orchestra version, this same passage is always a highlight of any performance, the full weight of a symphonic cello section giving the music a heroic power. Yet here, with Steuermann in a neat moment omitting the violin throughout the whole phrase, the music becomes strong but tender - Hewitt's piano gently intoning a simple chordal accompaniment to Carroll's "forgiving" cello. At the risk of sounding like a cracked record, the level of execution here is of the very highest quality imaginable. Again, Rafal Zambrzycki-Payne's control in alt is remarkable - what a pleasure to hear the dynamics of a score accurately executed - he achieves a disembodied sweetness of tone that is ideal particularly in the closing pages of this remarkable score where the lovers wander through the starlit wood in quiet communion. The fluttering arpeggio figurations lie well for the piano so this is a moment when the Steuermann transcription scores over the string original. I am not sure quite when a disc moved me as much as this one - these closing bars providing a perfect ending to a rather wonderful experience. I see from the catalogue that Naxos released a disc earlier in the year of this same transcription logically coupled with the Korngold Op.1 Piano Trio. I have not heard that disc so cannot compare this performance with that one or indeed any others. To cover briefly 'any other business'. According to the liner the Dimension Trio met at the Menuhin School well over a decade ago - the playing smacks of extended friendship and deep mutual respect. There is a little mystery from the website; the entries and updates there are rather intermittent and certainly not reflective of a group of this stature actively pursuing a trio career. My guess is that they come together as much as other individual performing commitments permit for the sheer pleasure of working together. To reiterate, the engineering is as excellent as the music-making and MacDonald's liner is a pleasure to read. Congratulations to Champs Hill Records for initiating this production and - as the personal note from the players makes clear - allowing the trio to choose their own programme. More please. A disc that was a privilege to listen to.